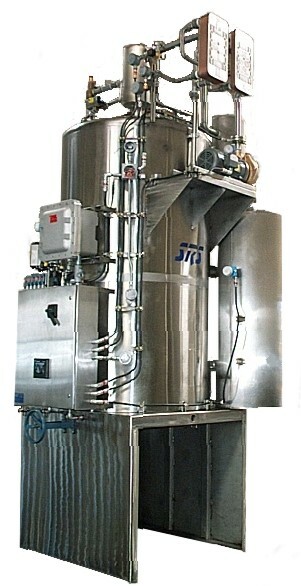 The SRV-Series is designed for system sizes handling 25-250 gallons per hour and is the simplest and highest performance system design in its price range.It is composed of a non-scraped vessel with a 70 cone design which incorporates a unique steep walled distillation chamber. This is surrounded by a large volume oil bath heated with electric immersion heaters or optional steam coils. The design provides excellent heat transfer characteristics because of the large surface area in contact with the solvent and the oil media. In most applications, the steep walls keep the inside surfaces of the distillation chamber free of sludge build-up for maximum heat transfer from the hot oil media, and assists in discharging the sludge from a bottom mounted 6″ discharge valve. This series is utilized for waste streams which are not prone to hardening in the presence of liquid solvent, and provides ease of residue removal. The SRV-Series model can be heated with steam or electric heaters. The heating medium is high efficiency heat transfer oil which is recirculated in a jacket around the distillation vessel. By providing pre-heated medium with an even distribution of heat, there is less chance for hot spots and less volume of heating medium is required. 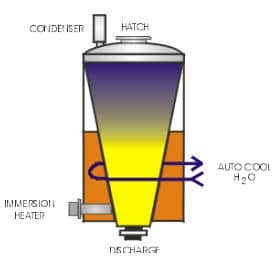 The auto cool option is accomplished through an in-line heat exchanger in the recirculating loop. Vessel Design: Unlike typical flat bottom or straight side, dished bottom stills, SRS provides a true cone vessel. Model SRV non scraped model has a 70 degree cone vessel. This design allows proper heat distribution and ease of residue removal. This design has more heat transfer area at the top of the cone. As sludge accumulates, it naturally drops to the bottom of the cone leaving the larger surface area at the top to keep on distilling at optimal efficiency. Under these conditions, the sludge is always submerged in solvent and acts as an additional safety feature with reactive materials such as nitrocellulose. PLC controls: SRS offers a variety of PLC systems. All programs and listings are made available to the user for on-going maintenance. Set points and temperature ranges are preset at the factory, and are protected by password access. This password control is passed on to the user to be used only by authorized personnel. Heating Methods: The SRV-Series model utilizes a self contained heating system with immersed electric heaters or steam coils in a high volume oil bath. Cooling of the residue is accomplished by circulating a cooling medium through coils in the oil bath. Auto Load: Vacuum fill or optional pump fill system with electronic level sensor to maintain operational level within the distillation vessel. In addition to the level sensor control, all SRS systems have a secondary level of safety by incorporating a PLC driven watch dog timer feature, which stops the auto fill action upon the expiration of the allocated time, both for an initial fill (typically 10 minutes) and consequent refills (typically 2 minutes). This ensures against accidental overfilling. Nitrocellulose Package: TheNitrocellulose control package is required when Nitrocellulose is present in materials being distilled to prevent a Nitrocellulose Reaction typically found in the printing industry. Single Point Utilities Connections: Minimal installation time and cost. Units are skid mounted, assembled and tested. All systems are wet tested at the factory before shipment.